Montana Creek Campground, Parks Highway Alaska. Guide to Alaska Camping has spent the night at Montana Creek Campground on the Parks Highway near Talkeetna Alaska. Alaska Campgrounds & RV Parks with Fishing Too! Summer is time to visit Montana Creek RV Park. Montana Creek offers fishing for king, pink, silver and chum salmon, rainbow trout, and grayling with a few Dolly Varden late in the season; trout fishing also picks up steam as the season progresses and the salmon begin to spawn. 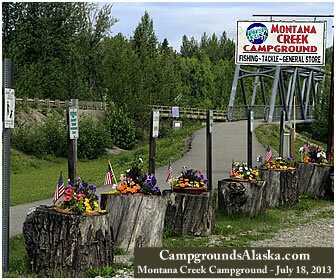 Montana Creek Campground is the oasis in a midst's of the Alaska heartland. Fishing is great and the camping is superb. The campground store is a full country mercantile with everything from fishing tackle and novelties to ice cream bars and loaves of bread. Fishing is great at Montana Creek Campground along the Glenn Highway in Alaska. Fishing for rainbow trout, king, silver, pink and chum salmon adds plenty of excitement for the anglers looking for that campground with great fishing for their Alaskan vacation. Description - Popular family campground for it's fishing and the paved walking and biking trail with underpasses at the George Parks Highway and a bridge that crosses over Montana Creek. Big sites with a wilderness Alaskan touch make your stay a lot more enjoyable than the crowded RV parks with no atmosphere or character. Directions - Located about 110 miles from Anchorage where Montana Creek crosses the George Parks Highway or 275 miles south of Fairbanks just a few miles from the turnoff for Talkeetna, AK. Services - Extremely well kept and clean campground with on site maintenance and managers. Additional Amenities - Fishing gear, ice, groceries and more. Paved trail with underpasses on the George Parks Highway and a bridge over Montana Creek. Montana Creek Campground has been greatly upgraded over the past few seasons and the quality of the sites is second to none. Seriously, it's our personal feeling that there simply is no better place to spend a week than Montana Creek Campground if you're looking for a great Alaskan experience with some excellent trout and salmon fishing right out of your front door. Bank fishing for grayling at Montana Creek Campground AK. Plan on checking out the fishing when staying at the Montana Creek RV Park located on the banks of this clear water Alaskan stream. 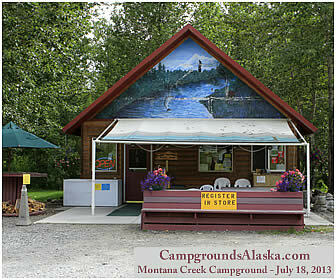 Montana Creek Alaska fishing reports are available at the campground store.